Thieves stole all my gear from my trailer in September and I'm now starting to replace everything . I am considering a sling pack to replace my vest. I have looked at the Fishpond and Simm's options and I'm having a difficult time deciding. I haven't tried or looked at the Orvis, Umpqua or Patagonia packs yet but I intend to very soon.. There are so many different bags to try on. Each has great features and things that I don't like. It seems that carrying a net with these packs is very awkward and I haven't really found a perfect solution for that problem. Top on my list right now are the Fishpond Summit sling, Fishpond Delta and Simms Ambi Sling. I was hoping to get some feed back from my fellow fly fishermen to help me make my decision. I would appreciate any advice on any sling pack. Pro's...cons as well as any net solutions. I wear a vest most of the time but if it is raining or bad weather I use my Fishpond Thundrpack, it's waterproof. Ive been using my Patagonia Sling for ~5 years, and wouldn't look back. It's been great. 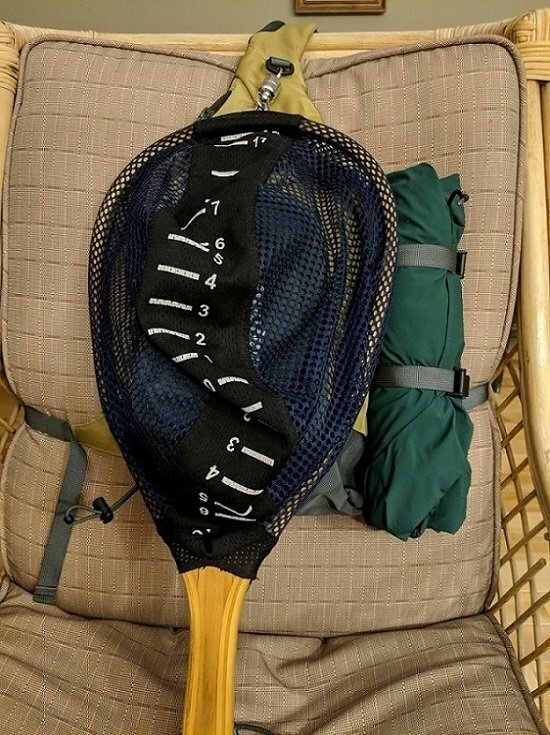 It also has the best D-Loop positioning I've seen for a net (i dont carry a net anymore), pretty well lines up exactly like you were wearing a vest. I've been using the previous generation of the Patagonia Stealth Atom sling for a couple of years and have been happy with it's flexibility. Lots of room to hang crap from the strap as you can see! 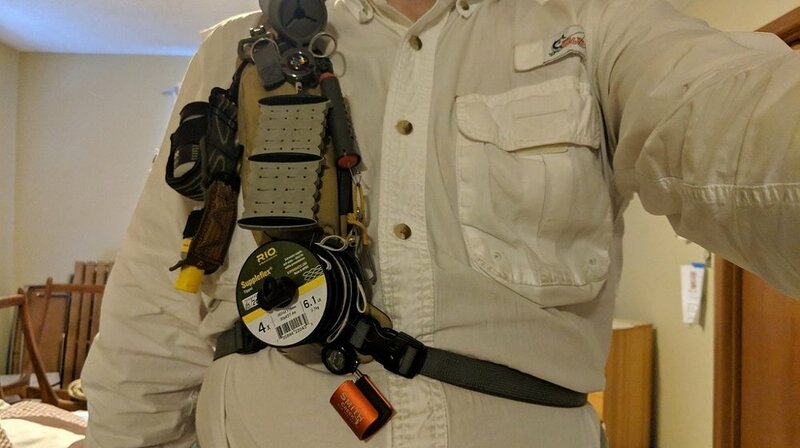 I keep a small fly box in my left shirt pocket and between that and the fly patch, I don't end up having to swing the main compartment around very often. I like the fact that the water bottle pouch on the Patagonia slings are on the outside of the main compartment. I can get my water bottle without swinging the main compartment around. The Smith Creek rod holder is convenient for fly changes in the river and releasing fish. I hang my net from the d-ring using a magnetic holder at the top of the loop, not from the end of the handle. That way the net nestles on top of the sling and doesn't swing around at all. I don't find re-attaching the net any more awkward than with the vest I previously used. p.s. I am left-handed. A right-handed person may want less junk hanging on their right side. This is the net hung over the main compartment, from the d-ring, on the Patagonia Stealth Atom sling. The rod holder straps work great for my rolled up wading jacket. I own the older fishpond delta. It’s a nice pack but there are some things I’m not a huge fan of. The pouch with the water proof zipper doesn’t make much sense as there are holes in the bottom of it, and it is not very comfortable to wear on really long trips and you might need to switch shoulders (if your carrying a lot), but that could be the case with most sling packs. Model I bought is called The Beast and find it fits the ideal balance between size and practicality for use and storage. Used it for past two seasons. Great net ring. KEY for me is the sling sits on my left shoulder, off my right handed casting arm eliminating fatigue. Nothing in front when casting to tangle as well. Vedavoo offers left or right shoulder models. I have the Fishpond Summit - been using it for two or three years now. It's a good mid-sized sling. Comes with a velcro foam patch for the outside of the bag, and has velcro pile on the front of the strap (so, on your chest ) for another patch if you want one there. Connections points for nippers, foreceps, tippet spool holder, etc are all well-placed. There's a sleeve in the back of the bag that fits a long-handled net, but I use a magnetic net holder on the top of the pack (very similarly located to what Haggis57 posted above), and I find it quite easy to reach and replace the net from my back. It holds enough for a full day outing, and has a good waterbottle pouch on the exterior that doubles as a garbage receptable for me. Also has exterior strap points for a raincoat. The extra snap connector (for the secondary strap) didn't stay on very well for me, but fishpond mailed me like three extra ones for no charge when I asked them. All in all, I'd buy one again. I hated my first vest (I tend to tangle on stuff hanging on my front), and this was a great solution.